Rent 6 nights and get the 7th night FREE! (Some restrictions apply) Call our number (316) 788-6303 for Additional Year-Round Discounts! This spacious, four bedroom townhouse has all the comforts of home with a beautiful view of the wooded 'hills and hollers' of the Ozarks. The townhouse(s) provides an ideal setting for group vacations, family gatherings, and family reunions. The main level duplex townhouse consists of a master bedroom with king-size bed,private bath, and door to deck. The guest room has a queen-size bed and a shared bath. There is a modern sleeper-sofa in the great room, full kitchen, dining area, Internet connection, Cable TV, and large furnished deck off of the great room. The kitchen is equipped with all the usual plus 2 microwaves, 2 coffee pots, 2 crock pots, BBQ grill, ice maker and dishwasher. A large capacity washer and dryer are off of the hallway. The carport/patio has a ceiling fan/light for your outdoor comfort while preparing a BBQ dinner on the Weber Gas Grille. Additional fold up tables/chairs are located in carport storage. The lower level is accessed from an inside stairway or private rear entrances and consists of two lock-out suites, each with a full bathroom, a king-size bed, a queen-size bed, cable TV, DVD player, breakfast bar with sink, microwave, small refrigerator, coffee maker as well as a table and chairs for four. The lower king-size suites can also be accessed by their private entrances from ground level parking in the back. This townhouse is located at Notch Estates on West Highway 76, only 5-20 minutes from Branson music shows and factory outlet malls. Just 1 mile and minutes away from Silver Dollar City and 3 miles to a Wal-Mart Super Center. A Marina & Beach on Table Rock Lake and Golf Courses are nearby. Branson is our favorite vacation area. We never wonder what there is to do. We just have to decide which of the many things we are going to do. The festivals at Silver Dollar City and all the mulitude of entertainment options as well as the beautiful scenes at Notch. Having nature trails on premise and a private fishing lake with fishing dock is a big plus. Maintained by A/C professional Ceiling fans in Master bedroom, guest room and great room along with a Vornado fan in each lower bedroom. High speed wireless is provided in the townhouse. (3) Large refrigerator in the kitchen and a small refrigerator in each lower level bedroom. 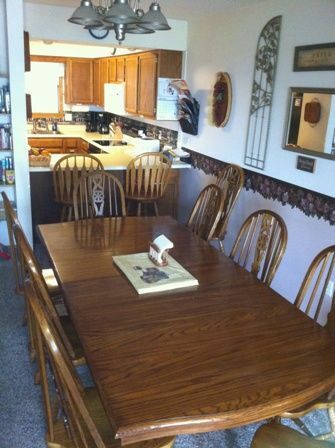 Large dining table w/place settings for 14 people. The large kitchen is fully equiped including a glasstop stove. The balcony/deck overlooks an Ozark valley and has 2 sets of patio furniture. (2) The deck is furnished w/tables and chairs for 14 people. The covered carport can serve as an additional patio. Tables and chairs are available in carport storage. Clubhouse and meeting room available onsite. Reunion Shelter with Grill and Play Area next to a swimming pool and a 2nd pool nearby. NATURE trails are onsite. Commercial style Basketball Goal. This townhouse is located at Notch Estates on West Highway 76, only 10-20 minutes from Branson music shows and factory outlet malls. Just 1 mile and minutes away from Silver Dollar City and less than3 miles to a Wal-mart Super Center. A Marina & Beach on Table Rock Lake and Golf Courses are nearby.